Here's a little something I hope will bring a smile to your face[s]. 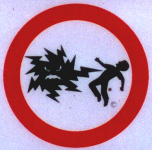 This is a Warning Decal on a Pad Mount Transformer, owned by SDGE [San Diego Gas and Electric]. Notice the angry "Electricity" which is attacking the intruder. Here's a close-up shot of the graphic. This one had me laughing for days when I first saw it!!! I sure hope everyone finds them a little funny, as that's why I posted them here - to get a few smiles, not to insult anyone.